If it wasn’t the greatest day in the history of the University of the Fraser Valley golf program, it was awfully close. 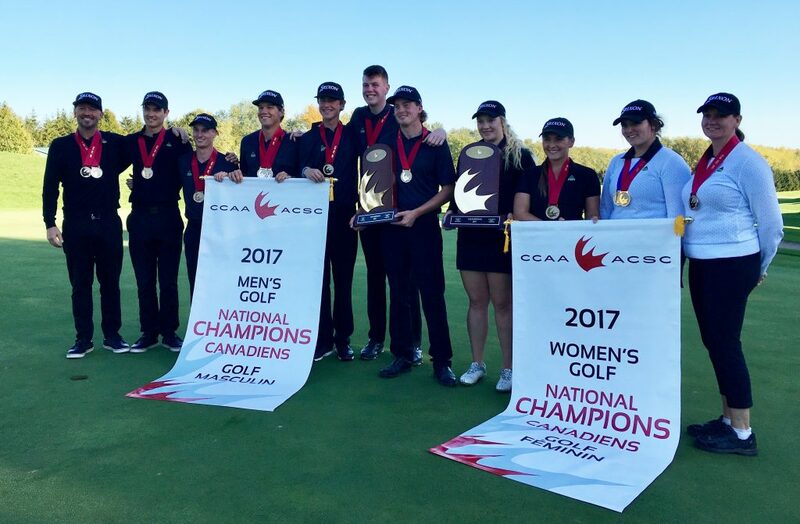 The Cascades completed an incredibly dominant run at the PING CCAA Golf National Championships on Friday, sweeping the men’s and women’s team competitions at Royal Ashburn Golf Club in Whitby, Ont. Both UFV teams won their respective titles by double-digit margins, and each produced an individual medalist. Daniel Campbell was the men’s individual champ, winning by eight strokes, and Maddie Kapchinsky took the women’s silver medal. This marks the second championships for the Cascades men’s and women’s teams, and their second sweep – the Cascades claimed both titles in 2013, also winning the men’s and women’s individual silver and bronze medals that year. Beyond that, there have only been two other occasions in CCAA history where the same program won both team banners, and both times it was the Humber Hawks, in 2003 and 2007. Campbell’s victory was also of historical significance – he’s the first Cascades golfer, male or female, to win a CCAA individual crown. The Cascades men’s team put together a clutch effort on Friday to seal the championship. They had opened a nine-stroke lead after Tuesday’s opening round, only to watch PACWEST conference rival UBC Okanagan cut it to four after Round 2 and to two after Round 3. What’s more, three other teams were within 14 strokes heading into the final round, meaning that not even a podium position was guaranteed. But on Friday, the Cascades fired a collective score of 295, the second-best team round of the week and 13 strokes better than any of their nearest five pursuers going into the day. Their four-round score of +56 was good for a 16-stroke margin ahead of runner-up UBCO (+72), with Humber (+76) taking bronze. Campbell, a first-year Cascade who transferred to UFV from Skagit Valley College, was dominant throughout the week. The Bellingham, Wash. product carded rounds of 71, 72, 74 and 71 to finish at even par for the tournament, eight strokes ahead of UBCO’s James Casorso (+8). Charles-Eric Belanger (+9) of the Champlain St. Lawrence Lions won bronze, and UFV’s Zach Olson (+10) finished one stroke off the individual podium in a tie for fourth. Kyle Claggett (+22 for the tournament, T-17 overall) was among the heroes for the Cascades on Friday, firing an even-par 72, and All-Canadian Ben Whiton (+32, T-31) and Cole Briggs (+42, 45th) each posted two rounds that counted towards the team score over the course of the week. Campbell said that Royal Ashburn played tough all week, but that it reminded him of a course back home in Washington state that he plays often – Loomis Trail Golf Club in Blaine. “It was mostly just keeping it in play off the tee – I found a lot of fairways this week,” Campbell said, breaking down his approach. There wasn’t much drama for the Cascades women’s team on Friday – they led by 22 strokes at the start of the day, and ended up winning by 21 with a combined score of 59 over par for the week. The defending champ Georgian College Grizzlies and Champlain St. Lawrence Lions tied for second at +80. The women’s individual race, in contrast, was a thriller. Kelowna, B.C. product Kapchinsky came into the day tied with Champlain St. Lawrence’s Sarah-Eve Rheaume for the lead, and she played the front nine at even par to open a three-stroke lead. Kapchinsky’s back nine was solid, too, at two over par, but Rheaume played that stretch at one-under, highlighted by an eagle on the par-five 14th, to force a playoff. They played the par-four 18th again, and Kapchinsky left her approach shot short of the green while Rheaume found the dance floor but was left with a long birdie putt. After chipping on, Kapchinsky missed a slippery downhill 10-footer for par, and Rheaume was able to two-putt for the win. UFV’s Emery Bardock (+43), the first-round leader, finished fifth overall, and fellow All-Canadian Hannah Dirksen (+47) was eighth. The PING CCAA National Championships mark the conclusion of the Cascades’ fall season. Their spring campaign culminates with hosting the Canadian University/College Championship, May 29 to June 1 at Chilliwack Golf Club.